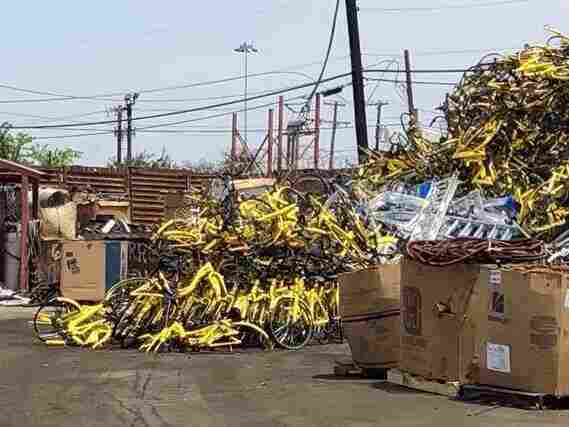 Hundreds Of Bikes Dumped At Dallas Recycling Center As Ofo Leaves Market "Terrible," Dallas Mayor Mike Rawlings said of the sight of hundreds of bikes in a massive pile. Ofo sold the bicycles as scrap metal. In the past year, thousands of Ofo bicycles have popped up on the sidewalks of Dallas and other cities — but the company has recently been shrinking its operations. These bikes were photographed in Singapore last summer. The recycling center "purchased the irreparable bikes as scrap metal," CMC's Public and Investor Relations Manager Susan Gerber said in a statement to NPR. Ofo bikeshare bikes are piled up at a Dallas recycling center on Friday after the company decided to exit the market. Based in Beijing, Ofo abandoned the Dallas market in July. As member station KERA reports, "It's one of three bike-share companies that have left Dallas since late June, when City Council approved regulations that require companies to get permits and pay the city per bike or scooter." The ubiquity and seeming disposability of the bikes in Dallas prompted hundreds of public complaints about their being left strewn across sidewalks or tossed into waterways. An Instagram account called dallasbikemess documented some of the most striking scenes. In January, Dallas told Ofo and four other bike-share companies that they needed to do more to keep their bicycles from blocking walkways, pedestrian ramps and other areas. There were so many, Rawlings said, it seemed the brightly colored bikes could "asexually reproduce or something." This summer, as Dallas and other cities enacted laws to rein in the bikes — and as more cities approved the use of dockless electric scooters — Ofo began to shrink its U.S. footprint. In July, Ofo shut down its Chicago program after the city changed its rules to favor short-term rental bikes that can lock to stationary objects — through a U-lock or a cable — rather than the self-contained wheel lock that Ofo and other bikes use. 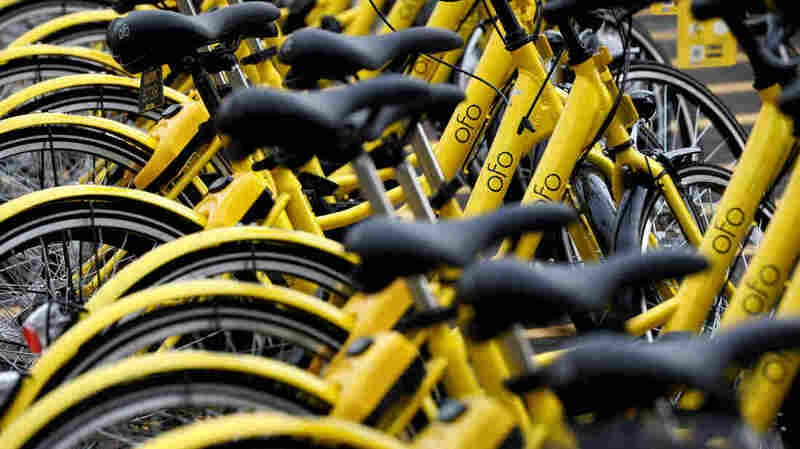 The company once had more than 40,000 bikes in the U.S.; on Tuesday, Ofo representative Taylor Bennett said via email that the current number "is proprietary." As quickly as it expanded into U.S. cities, Ofo has recently been leaving some of those markets. After adding more capacity in Miami in late June, the company said it would leave the city. And in Atlanta, Ofo pulled out in July, one month after arriving. Ofo's attempt to flood the U.S. market with $1-a-ride bikes was boosted by $700 million from investment funds in July 2017. But then complications arose — from new competition from electric bikes and scooters to new regulations backed by city officials and activists who said the bikes were creating messy hazards.